Gustiamo’s Edoardo is in the middle of a splendid adventure around Napoli and Salerno. He has been in the field learning all about the San Marzano tomato harvest at DaniCoop and Pasta Gragnano making at Pastificio Faella. We just talked to him. He is beaming with excitement. He told us that it was a privilege to meet the proud farmers who grow Real San Marzano tomatoes and who have been farming the land for decades. He loved seeing Mt. Vesuvio in the distance and the fertile soil of the tomato fields naturally irrigated with streams coming from the Sarno river. 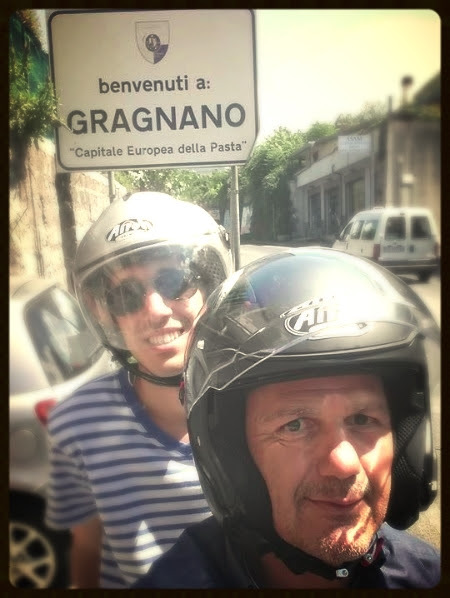 When visiting with Sergio of Pastifico Faella, not only did Edoardo get to ride on the back of Sergio’s Vespa, he also explored Gragnano and all of its pasta making glory. Edoardo, who knows that the water is very important to make good pasta, asked Sergio to take him to Gragnano’s natural spring. He drank the water from the stream and understood why IGP Gragnano pasta is so special! How cool is that? Also, we totally share Edoardo’s enthusiasm in getting to hang out with the famous bronze plates that give Pasta Faella that wondrous texture! All that adventuring can really work up an appetite. 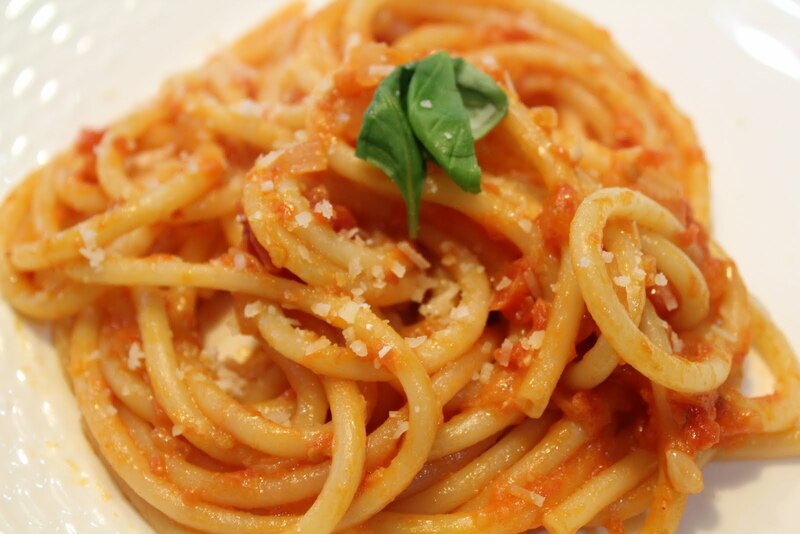 Back at Sergio’s the guys feasted on Pasta al Pomodro, what else?! Faella Bucatini and DaniCoop San Marzano Tomatoes! After that, it was time for Edoardo to head back to Napoli, where he chose to have a pizza made by one of the most celebrated pizzaioli, the famous Gino Sorbillo. Not only did Gino’s pizza rock Edoardo’s world, but reading Gino’s menu was like looking through the Gustiamo product catalogue. Edoardo was so proud to see that Gustiamo carries so many of the ingredients that Gino uses. Great minds think alike! Next Post The San Marzano Tomato Harvest! This looks like such a wonderful trip! 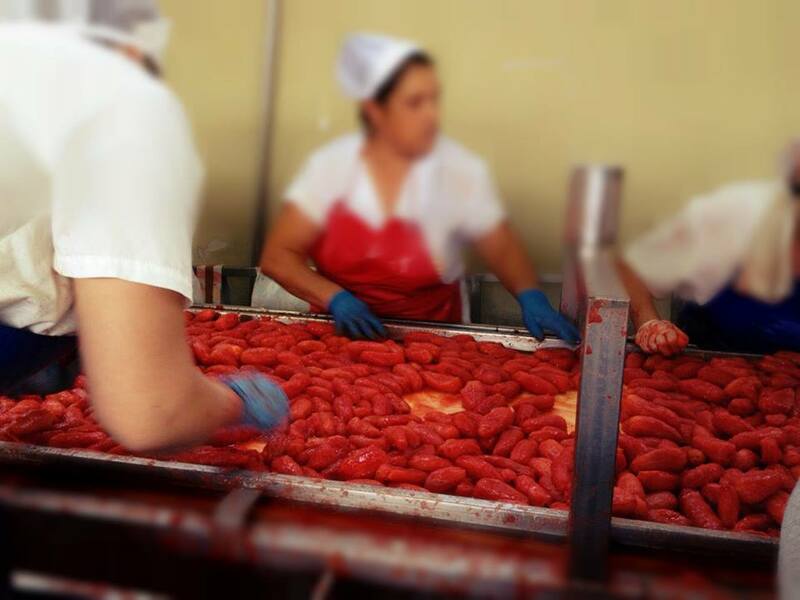 It must have been so cool to see the San Marzano harvest…. I make all my own pasta and pizza sauces from scratch and I’ve never had any tomatoes that compare to real San Marzano’s. How long does the harvest last? I did catch that article! Falsifying food to sound like the real thing has become a big problem because it gives the real stuff a bad name. As a farmer myself I can attest to the importance of terroir–it extends far beyond wine to fruits, vegetables, cheeses, and even pastas! Once you’ve had the real thing it is impossible to go back. Sounds like a fantastic trip! Great food truly starts with great ingredients.